Tom R. Lenz, D.V.M., M.S., Dipl. A.C.T., offers some sound advice about horse ear problems. Our expert explains an uncomfortable ear problem horses can face. Question: I am pretty sure my 14 year old mare has horse ear mites in her left ear (her right ear is fine). She will not let me touch her ear and it is a challenge to get the bridle on (I had to take the bridle apart the other day when I rode her, and she was fine). I do not see any swelling or any kind of abrasions around the ear. How do I get the mite medicine in her ear? Her ear must be very sore. She normally will put her head down for me to put the bridle on. She has already broken her lead rope twice by sitting back when I approach the ear. I do not have a stock to put her in. I have tried treats, showing her the bottle, rubbing the bottle around her face and she is fine with all that but the minute I get near the ear, she throws her head or sits back. Any suggestions? 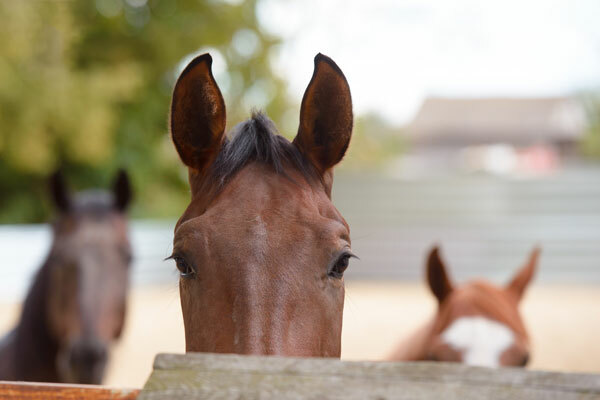 Answer: Horses, unlike dogs and cats, do not get ear mites. However, they can be infested with spinous ear ticks that live in the ear canal and cause a great deal of pain. They can also have a foreign object in the ear canal that may cause pain and inflammation, or they may be suffering from an external ear infection. Before you begin treatment, it is important that a definitive diagnosis is made, as the various conditions require different treatment. I would suggest that you have your local veterinarian examine the horse to determine the exact problem. They can sedate the horse and then use an otoscope to look deep into the ear. Once the cause of the problem is determined, your veterinarian can prescribe treatment and even give you tips on how to administer it.